Andrew's birthday weekend continued saturday night. 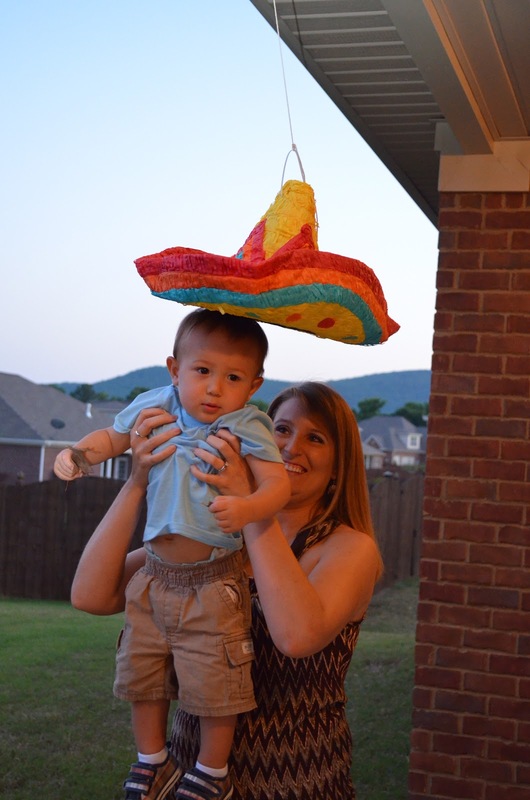 We invited our friends over to celebrate with a Mexican Fiesta. I guess it was Cinco de Mayo one week early. It was so much fun to eat, laugh, and spent time with our sweet friends! Our house got all fiesta-fied. I was really happy with how it turned out. Dessert table. I saw the idea for the parasail topiaries online somewhere. They were not quite as easy as I thought they might be...it was hard to keep the umbrella part open, but it worked. Andrew specifically requested my Key Lime Cupcakes. I was happy to oblige because they are really yummy. Recipe here. One of the best parts of the table was the disposable plates, napkins and silverware. Made clean up a breeze. Menu: build your own taco bar, black bean chili, mexican rice, refried beans, and chips with salsa, queso, and homemade guacamole. This was my first experience with making guacamole and I think it turned out awesome. It was the pioneer woman recipe found here. After dinner we all got in touch with our inner child and hung a pinata in the shape of a sombrero. You can get a pinata to look like just about anything I learned. The pinata didn't last very long. I guess 28 year olds are a little stronger than 8 year olds. Still fun though. It was a really fun, casual party. Have I mentioned that we love our friends? We are so blessed to have such awesome couple friends to "do life" with.